© 2018 The Korean Vacuum Society. Received July 9, 2018; Revised September 9, 2018; Accepted September 12, 2018. Many studies have been conducted on large-scale graphene synthesis by chemical vapor deposition. Furthermore, numerous researchers have attempted to develop processes that can continuously fabricate uniform and high-quality graphene. To compete with other types of carbon materials (carbon black, carbon fiber, carbon nanotubes, and so on), various factors, such as price, mass manufacturing capability, and quality, are crucial. Thus, in this study, we examine various large-scale graphene production methods focusing on cost competitiveness and productivity improvements for applications in various fields. Graphene is a two-dimensional (2D) material with single-layer thickness consisting of carbon atoms in a honeycomb arrangement. It is superior to other carbon nanomaterials in terms of mechanical, chemical, and electrical properties [1–5]. Furthermore, graphene has both transparency and flexibility, which can be applied in various fields. Typically, most 2D materials are artificially fabricated, unlike zero-dimensional and one-dimensional materials. Physicists long argued that 2D materials could not occur in nature because of the thermodynamic instability of the 2D structure, until a research team led by Konstantin Novoselov and Andre Geim first isolated 2D graphene from graphite through a simple technique using Scotch tape at the University of Manchester, UK, in 2004 [6–9]. Thus, they confirmed the existence of 2D graphene materials, such as graphene sheets, and predicted that the charge carriers of graphene would behave like massless Dirac fermions . Since then, researchers around the world have been constantly interested in graphene because of its excellent physical characteristics and unique electronic structure. Although graphene isolated through mechanical exfoliation has excellent characteristics because of the minimized defects, it is difficult to use such graphene in various applications because of its small size . After chemically oxidizing graphite to obtain large-scale single-layer graphene, numerous researchers have used graphene oxide, which is dispersed in the solution, to fabricate thin films through self-assembly. Graphene films can be fabricated by chemically reducing such graphene oxide films. This method is advantageous because large-scale graphene films can be fabricated at a relatively low cost; however, its properties are degraded because of the overlapping and interconnected graphene flakes, in addition to the incompletely reduced graphene oxide in the structure [12–15]. Graphene synthesis via chemical vapor deposition (CVD) is considered to be the best method for synthesizing large-scale graphene. This method, which involves graphene synthesis on metal catalyst surfaces using nickel or copper metal catalysts to decompose hydrocarbon gases at high temperatures (1000 °C), was first reported between 2008 and 2009 [16–19]. Since then, numerous researchers have been actively investigating graphene synthesis using various metal catalysts, such as platinum, cobalt, iridium, ruthenium, gold, and metal alloys, to synthesize high-quality and uniform graphene [20–26]. The graphene synthesis mechanisms vary according to the properties of the metal catalysts. A typical graphene synthesis mechanism can be explained as follows. On typical metal catalysts with high carbon solubility, such as nickel and cobalt, the hydrocarbon gas decomposes and dissolves into the metal lattice, and subsequently precipitates onto the metal surface to form graphene after cooling. In this case, the number of graphene layers can be controlled by adjusting the thickness, reaction time, cooling rate, and concentration of the reaction gas depending on the type of the catalyst. Moreover, in the case of copper metal, the hydrocarbon gas that decomposes at a high temperature forms graphene through adsorption and self-assembly on the copper surface [8,27,28]. To synthesize large-scale graphene at a relatively low synthesis temperature along with controlling the catalyst metals, many researchers have been actively investigating graphene synthesis using various types of CVD methods, such as plasma CVD, surface wave plasma CVD, microwave plasma CVD, and inductively coupled plasma CVD [29–32]. Furthermore, a large-scale continuous graphene production process based on a roll-to-roll synthesis process has been actively examined . The original intention of manufacturing large-scale graphene using CVD was to replace indium tin oxide (ITO), which is used as a transparent electrode that is applied in various display materials. At the inception of graphene research, the price of the ITO material was increasing, and its electrical characteristics at approximately 102 Ohm levels were replaceable by graphene. However, in addition to the recent continuous drop in ITO prices, the performance of ITO has improved by tens of Ohms. Thus, to replace ITO with graphene where it is difficult to use ITO, further studies are required to develop applications through the development of processes that can be applied to a flexible display device, rather than to display devices based on rigid substrates. Thus, continuous studies on graphene-based transparent electrodes for applications in flexible electronic devices are required, and such studies have been conducted accordingly. In this study, we review the status of synthetic processes for mass production of large-scale graphene, and we briefly discuss the quality and prospects of graphene synthesized according to each manufacturing method. The first results regarding synthesis of large-scale graphene based on the roll-to-roll processes were reported by S. Bae et al. in 2010 . Large-scale graphene was synthesized using thermal CVD in an eight-inch quartz tube, as shown in Fig. 1(a), and was further transferred to a plastic substrate using the support layer of a “thermal release tape.” This “thermal release tape” is a film that loses adhesion when the film is heated to a certain temperature. This transfer method using thermal release tape as a supporting layer has some significant advantages. First, ultra-large graphene can be fabricated by overcoming the limitation of transfer area in a conventnional wet transfer method. A conventional wet transfer method uses an existing polymer precursor (PMMA) coated onto a graphene/Cu film and transfers it to a target substrate. It is difficult to handle graphene during wet transfer, and the transfer process induces numerous unintended wrinkles, thereby limiting the transfer area. However, in the dry transfer method using a thermal release tape, the transfer area is not limited because the supporting layer fixes the graphene firmly. Second, it can greatly reduce the time required for graphene transfer. The thermal release tape, which receives thermal energy, loses its adhesive property within tens of milliseconds, thereby facilitating a roll-to-roll process that rapidly produces printouts [Fig. 1(b)]. The production rate of graphene using this dry transfer process reaches up to 200 mm/min. The single-layer graphene transferred onto a plastic substrate exhibited a sheet resistance of approximately 120 Ω/sq and excellent optical transparency (up to 97 %). Subsequent doping and lamination have shown that a graphene-based transparent electrode can be fabricated with sheet resistance of approximately 30 Ω/sq and transmittance of 90 %. The optical and electrical properties of graphene is comparable with those of the other emerging conducting electrodes, such as metal nanowire, metal oxide, and carbon material (Table I). Figure 1(c) shows a touch screen developed for the first time using a prototype graphene-based transparent electrode. In 2011, a research team led by T. Hesjedal in U.K. published results showing continuous graphene production at atmospheric pressure based on the roll-to-roll process . The study showed specific results when the copper foil was used as the catalyst substrate. The precursors can be continuously fed into the reaction chamber and graphene is formed by selecting the appropriate process temperature gradient, syngas injection, and heating/cooling rate [Fig. 1(d)]. The study specified various important process parameters, such as the heat treatment tendency of the metal foil according to the foil injection rate, changes in the metal foil characteristics according to the position and timing of the source gas injection, and influence of the cooling rate on the graphene quality, which were ignored in the batch-type CVD process. However, this continuous process has the problem of the copper foil getting stretched or twisted during the process because of the large distance between the winding and unwinding rolls. To overcome this problem, a research team led by A. J. Hart, at the University of Michigan, designed a concentric tube (CT) structure to synthesize graphene at high speed . As shown in Fig. 1(e), the copper foil is spirally wound around the inner tube and moves through the gap between the concentric tubes. This structure can minimize the difference in the synthesis temperatures depending on the position. This process can be used to control the tube wrapping cycle by using the copper foil to artificially adjust the heat remaining in the furnace, thereby facilitating a simple and effective heat treatment. Furthermore, the proposed “inner gas flow” structure enabled the formation of graphene with enhanced characteristics to be synthesized in a shorter time by distinguishing the heat-treated portion of the copper foil from its graphene synthesized portion, where the preheated syngas is simultaneously allowed to react with the copper catalyst. Figure 1(f) shows the prototype CTCVD fabricated based on this principle, and the production rate of graphene synthesized through this prototype can be adjusted between 25–500 mm/min. In addition to the thermal CVD method, Sony Corporation in Japan proposed a new method of supplying the heat required for graphene synthesis via Joule heating, through the application of current in the copper catalyst . This structure facilitates partial temperature control because the structure requires no additional furnace and induces heat generation in the sample itself. Figure 2(a) shows a conceptual diagram of the continuous graphene synthesis/transfer process using Joule heating. Figure 2(b) shows a photograph of a graphene-based transparent electrode product manufactured by continuously synthesizing graphene of 100m length at a rate of 100 mm/min, and the graphene is subsequently transferred onto a PET film of 230 mm width. The fabricated graphene has a sheet resistance of approximately 500 Ω/sq, which can be improved to 250 Ω/sq through an additional doping process. The sheet resistance uniformity of the continuously fabricated graphene was examined, revealing that the sheet resistance was uniform and stable along the length [Fig. 2(c)]. However, heat loss occurs at both ends of the foil when the copper foil was Joule heated. This heat loss induces a temperature difference between the center and edge of foil at both ends, which becomes disadvantageous for synthesizing uniform graphene over a large area. Industrial application of graphene based on the roll-to-roll process can be made available by overcoming some obstacles. One of the obstacles is the high process temperature (1000 °C) required to decompose the source gas and re-form the sp 2 bond between the carbon atoms during graphene synthesis. This temperature is too high for industrial applications; thus, low-temperature synthesis of graphene has become a challenging area. Plasma-enhanced CVD (PECVD) is one method that can be used to fabricate high-quality graphene at low temperatures. T. Yamada et al. at AIST Japan synthesized uniform few-layered graphene on a copper foil at 400 °C using the roll-to-roll CVD based on microwave plasma . A PECVD system equipped with two 2.45 GHz microwave generators has a built-in foil-wound winder and rewinder of 294 mm width [Fig. 3(a)]. According to Raman analysis, the intensity ratio (I2D/IG) of the 2D-band and G-band peaks ranged between 1.1 and 1.22, and the intensity ratio (ID/IG) of the D-band and the G-band peaks ranged between 2.18 and 2.21, which suggested that the synthesized graphene is approximately 9 nm in size with small grains and some defects [Fig. 3(b)]. Figure 3(c) shows a photograph (size: 249 × 100 mm) in which graphene synthesized at low temperature is transferred onto a flexible PET substrate. As shown in the photograph, the synthesized graphene-transferred PET sample shows excellent optical transparency and high light transmittance of 95.2 % in the visible range (400–800 nm). However, as discussed previously, graphene synthesized at low temperatures requires further improvements because of its poor properties. Recently, Zhong’s research team at the University of Cambridge reported a vertical open-type CVD synthesis process to continuously synthesize graphene in a roll-to-roll manner . The developed process is a CVD process at atmospheric pressure rather than a conventional low-pressure synthesis process, in which continuous fabrication of graphene is advantageous as compared to that using a vacuum process. The synthesis cost increases because a carrier gas, such as Ar or N2, should be continuously fed. Thus, further improvements are required to reduce the cost of the process. Figure 4(a) shows a schematic diagram of the overall process for synthesizing graphene, and Fig. 4(b) shows the actual structure of the reaction chamber described in the schematic diagram. The synthesis process consists of three steps, as shown in Fig. 4(c). In the first step, the chamber temperature is brought to the 1010–1070 °C range in an N2 atmosphere, and subsequent synthesis proceeds for approximately 40 min under an N2 +H2 + CH4 gas mix. After the synthesis process completes, the final process is completed by cooling the chamber in an N2 and H2 atmosphere. Although the heating zone in the furnace is 30 cm wide, the actual temperature at both ends is relatively low. Thus, the zone where graphene is synthesized is approximately 15 cm wide, as shown in Fig. 4(d). Various studies have been conducted that focus on the continuous process, while further research on productivity improvement is required due to the low graphene synthesis rate. 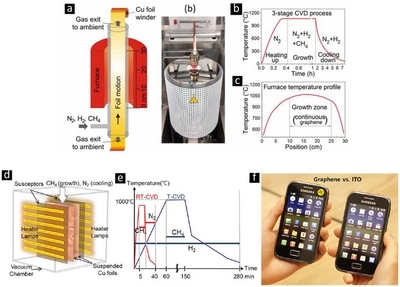 Moreover, recently, Samsung Techwin (currently Hanwha Aerospace) and the Hong research team at Seoul National University reported a process technology based on rapid thermal CVD (RT-CVD) with an area of 400 × 300 mm2 for rapid graphene synthesis . This unique technology is used to synthesize high-quality graphene without using hydrogen gas of RT-CVD, while conventional thermal CVD methods using hydrogen for graphene synthesis have safety issues. For conventional thermal CVD, the synthesis temperature is not maintained because the heat reflected from the copper foil loses energy. To complement this disadvantage, the research team designed a synthetic apparatus that discharged near-IR rays through the graphite susceptor to uniformly transfer heat to the copper surface, as shown in Fig. 4(e). This synthesis method requires heating with a halogen lamp, and the method can be used to synthesize high-quality graphene by reducing the 3–4 h synthesis time based on conventional thermal CVD to 40 min or less. Although this new method implements a batch-type synthesis such as roll-to-roll rather than a continuous process, this method can complement the disadvantage of the conventional thermal CVD processes because this method can increase the amount of graphene fabricated by reducing the process time [Fig. 4(f)]. The graphene synthesized through this method showed a resistance of approximately 250 ± 17 Ω/sq after transferring the graphene onto a PET film, and the standard deviation was approximately 10 %. Furthermore, for testing practical applications, we fabricated a constant voltage-type multi-touch screen by applying graphene to a mobile phone as a transparent electrode. We reported that graphene had a similar performance as that of a conventional ITO. This study is the first example of application to currently available commercialized display devices, and the study results show that the usability of graphene is high in the future. Various studies on the synthesis of large-scale uniform graphene with high quality have been continuously conducted. An interesting research result was reported recently. The Hong research team at Seoul National University and Graphene Square, Inc. used a laser printer to synthesize graphene and graphene-like structures [Fig. 5(a)] . In this method, the material was subjected to graphitization through heat treatment at a high temperature after the toner material used in a laser printer was printed onto a copper foil rather than paper. This method can be applied to the roll-to-roll process and used to easily form a desired pattern. This process is highly desirable depending on the application field. Despite the differences from the graphene films previously described, this study is the first example illustrating synthesized graphene-like structures in a roll-to-roll manner through a continuous process. Figure 5(b) shows the states before and after the annealing process by patterning the toner material on the copper foil. Figure 5(c) shows that graphene and graphene-like structures are formed via heat treatment at temperatures ranging from 700–1000 °C in an H2 and Ar gas atmosphere. An electron microscope was used to confirm that approximately 7 μm of the toner material was deposited on the copper surface before the heat treatment process, and subsequently, the graphene and graphene-like structures with approximately 4 μm thickness were formed [Fig. 5(d)]. A transmission electron microscope was used to identify that a few-layer graphene film was formed and confirm if the synthesized graphene film was crystalline. In particular, the results show that the graphene structure formed at the interface adjacent to the copper foil surface, which suggests that the copper foil serves as a catalyst to form graphite having the same crystallinity as the toner material. 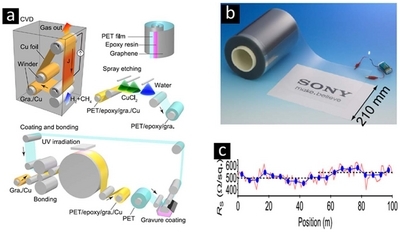 As a result, the graphene and graphene-like films can be synthesized through a printing process on a simple metal foil, which can be used as a supercapacitor electrode applicable to a flexible display. This new type of process technology can be applied in various forms, depending on future application fields. A few micro-sized graphene flakes were peeled off using Scotch tape in 2004; thus, graphene that are several hundred meters long are synthesized and transferred using a roll-to-roll process. This advance in the process technology can attribute to the potential of graphene to be used in high-performance flexible devices that will be in demand in the future. However, there are still several challenges that must be addressed before graphene can move beyond the research phase and towards commercialization, as summarized in Table I. First, uniformity should be ensured. 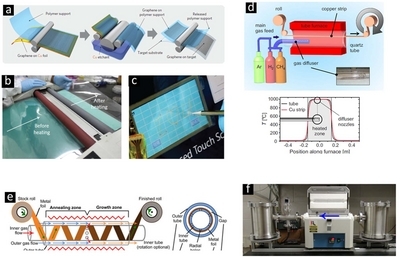 Although the roll-to-roll process can be used to continuously fabricate large-scale graphene, synthesizing uniform nanomaterials with atomic-layer thicknesses over the entire surface is still challenging. In addition to the academic efforts, advances in the process technology that can provide more precise control process parameters are required. Second, a low-temperature process should be developed that can produce high-quality graphene. Although a low-temperature process using plasma has been reported in the academic literature, the conductivity and crystallinity of the graphene produced is not even half as good as that of graphene synthesized at high temperature. Considering its compatibility with the plastic substrate used in the actual roll-to-roll process and its compatibility with other roll-to-roll processes, high-quality graphene should be synthesized at a minimum temperature of 300 °C. Thus, studies on interfacial reactivity control of metal catalysts, which can lower the formation energy of graphene, have been conducted globally to develop both new synthetic materials that can be fabricated using low-temperature processes as well as the process technology to fabricate these materials. The other alternative method is to improve the conductivity of graphene by post-treatment after low-temperature synthesis. Meanwhile, various doping methods are being systematically studied, such as hetero-atom doping, chemical doping, and electrostatic field tuning [41–46]. Therefore, it is necessary to complement the shortcomings of low-temperature synthesis by introducing a doping method that is compatible with the mass production process of graphene. Finally, this low-temperature synthesis process can further enhance the price competitiveness of graphene by reducing the unit production cost. For example, in the field of transparent electrodes, the ITO films deposited on the plastic substrates nearly dominate the market of flexible transparent electrodes, and the price is merely $15/m2. Thus, to replace the conventional commercialized materials, reducing the unit production cost through cost reduction of raw materials (catalyst metal, synthetic materials, and so on) and developing low-temperature processes are essential. Graphene is considered to be beyond the turning point of commercialization given that the applicability of the roll-to-roll process has been proven. Based on the output uniformity and improvement in the process technology, demand for graphene will be generated in the market if its quality and price are secured. The use of graphene-based products in our daily lives can increase if an increase in production because of demand and a reduction in the unit production costs occur in the market. This study was supported by the Korea Institute of Science and Technology (KIST) Institutional Program and the Industrial Strategic Technology Development Program (10079969) funded by the Ministry of Trade, Industry & Energy (MOTIE, Korea). Fig. 1. (a) Schematic of the roll-based production of graphene films grown on a copper foil. (b) Roll-to-roll transfer of graphene films from a thermal release tape to a PET film at 120.8 °C. (c) A graphene-based touch-screen panel connected to a computer with control software. (Reprinted with permission from , S. Bae et al. Nat. Nanotech. 5, 574 (2010) © 2018, Nature Publishing Group.) (d) Copper is fed continuously through the 25 mm diameter quartz tube furnace with a roll-to-roll system at a velocity of 1–40 cm/min. Ar and H2 are fed into the main tube, whereas CH4 is provided through the gas diffuser system. The outlet nozzles are placed downstream of the position where the Cu strip has reached the desired growth temperature of 1000 °C. (Reprinted with permission from , T. Hesjedal, Appl. Phys. Lett. 98, 133106 (2010) © 2018, AIP.) (e) System schematic showing the helical feed path (left to right), sequential treatment zones, and internal gas injection holes. (f) Bench-scale prototype of the CTCVD system (setup where processing is right to left), with rails for alignment with tube furnace. (Reprinted with permission from , E. S. Polsen et al. Sci. Rep. 5, 257 (2015) © 2018, Nature Publishing Group). Fig. 2. (a) Continuous roll-to-roll CVD system using selective Joule heating to heat a copper foil suspended between two current-feeding electrode rollers to 1000 °C to grow graphene (Gra.). Reverse gravure coating of a photocurable epoxy resin onto a PET film and bonding to the graphene/copper foil, followed by curing of the epoxy resin. Spray etching of the copper foil with a CuCl2 solution. Structure of the fabricated graphene/epoxy/PET film. (b) Photograph of the graphene/epoxy/PET roll before doping. The widths of the graphene/epoxy and base PET films are 210 and 230 mm, respectively. (c) Rs of the graphene/epoxy/PET film along the longitudinal direction measured at every meter (red line). Each point on the red line is an average of five measurements taken at different positions in the transverse direction. The five-meter averages (total of 25 measurements) are also shown by the blue circle symbols. (Reprinted with permission from , T. Kobayashi, Appl. Phys. Lett. 10, 023112 (2013) © 2018, AIP). Fig. 3. (a) Schematic of the roll-to-roll CVD apparatus for graphene film deposition. (b) The graphene film transferred onto the PET film, indicating that the uniform film is obtained by roll-to-roll MWPCVD. (c) Raman spectrum of the obtained graphene film. The peaks due to G and 2D at 1592.6 and 2652.3 cm−1 are observed, which indicate that the obtained film consists of graphene. (Reprinted with permission from , T. Yamada, Carbon 50, 2615 (2012) © 2018, Elsevier). Fig. 4. (a) Illustrations of a prototype open-type R2R CVD reactor for the growth of graphene on Cu foils, (b) the 3-stage CVD process, and (c) the temperature profile of the furnace for both stationary and moving foils. (Reprinted with permission from , G. Zhong, Appl. Phys. Lett. 109, 193103 (2016) © 2018, AIP.) (d) Schematic illustration of the RT-CVD synthesis setup. The graphite susceptors between the heater lamps and Cu foils convert the near-IR lights into thermal radiation. The CH4 and N2 gases are used for the growth and cooling processes, respectively. The Cu foils are suspended vertically during the growth. (e) Graphene growth conditions of RT-CVD compared with those of T-CVD. (f) Photograph of a graphene-based touch screen phone (left) in comparison with an ITO-based touch screen phone (right). (Reprinted with permission from , J. Ryu, ACS Nano 8, 950 (2014) © 2018, American Chemical Society). Fig. 5. (a) Schematic illustration of the synthesis process of the graphene-graphitic carbon supercapacitors using a common laser printer. The laser-toner powder as a carbon source is prepatterned on a metal foil. After the annealing process, the graphene-graphitic carbon films on the metal foil are directly used as supercapacitors without additional treatment. (b) Optical microscope images of the graphene-graphitic carbon devices before/after the annealing process. (c) SEM images of the nonpatterned (left) and patterned (right) areas after annealing. (d) Cross-sectional SEM image of the graphene-graphitic carbon films after annealing. The inset shows a cross-sectional SEM image before annealing. (e) High-resolution TEM image of the graphene-graphitic carbon. The inset shows the corresponding diffraction pattern. (Reprinted with permission from , S. Kang, ACS Appl. Mater. Interfaces 10, 1033 (2018) © 2018, American Chemical Society). Pros and cons of the large area synthesis method. Bolotin, KI, Sikes, KJ, Jiang, Z, Klima, M, Fudenberg, G, Hone, J, Kim, P, and Stomer, HL (2008). Solid State Commun. 146, 351. Morozov, SV, Novoselov, KS, Katsnelson, MI, Schedin, F, Elias, DC, Jaszczak, JA, and Geim, AK (2008). Phys Rev Lett. 100, 016602. Balandin, AA, Ghosh, S, Bao, W, Calizo, I, Teweldebrahan, D, Miao, F, and Lau, CN (2008). Nano Lett. 8, 902. Lee, C, Wei, X, Kysar, JW, and Hone, J (2008). Science. 321, 385. Zhu, Y, Murali, S, Cai, W, Li, X, Suk, JW, Potts, JR, and Ruoff, RS (2010). Adv Mater. 22, 3906. Peierls, RE (1935). Ann I H Poincare. 5, 177. Landau, LD (1937). Phys Z Sowjetunion. 11, 26. Novoselov, KS, Geim, AK, Morozov, SV, Jiang, D, Zhang, Y, Dubonos, SV, Grigorieva, IV, and Firsov, AA (2004). Science. 306, 666. Novoselov, KS, Jiang, D, Schedin, F, Booth, TJ, Khotkevich, VV, Morozov, SV, and Geim, AK (2005). Proc Natl Acad Sci. 102, 10451. Shin, D, Bae, S, Yan, C, Kang, J, Ryu, J, Ahn, J-H, and Hong, BH (2012). Carbon Lett. 1, 1. Bae, S, Kim, SJ, Shin, D, Ahn, J-H, and Hong, BH (2012). Phys Scr. T146, 014024. Eda, G, Fanchini, G, and Chhowalla, M (2008). Nat Nanotech. 3, 270. Dikin, DA, Stankovich, S, Zimney, EJ, Piner, RD, Dommett, GHB, Evmenenko, G, Nguyen, ST, and Ruoff, RS (2007). Nature. 448, 457. Stankovich, S, Dikin, DA, Dommett, GHB, Kohlhaas, KM, Zimney, EJ, Stach, EA, Piner, RD, Nguyen, ST, and Ruoff, RS (2006). Nature. 442, 282. Li, D, Muller, MB, Gilje, S, Kaner, RB, and Wallace, GG (2008). Nat Nanotech. 3, 101. Kim, KS, Zhao, Y, Jang, H, Lee, SY, Kim, JM, Kim, KS, Ahn, J-H, Kim, P, Choi, J-Y, and Hong, BH (2009). Nature. 457, 706. Reina, A, Jia, X, Ho, J, Nezich, D, Son, H, Bulovi, V, Dresselhaus, MS, and Kong, J (2009). Nano Lett. 9, 30. Li, X, Cai, W, An, J, Kim, S, Nah, J, Yang, D, Piner, R, Velamakanni, A, Jung, I, Tutuc, E, Banerjee, SK, Colombo, L, and Ruoff, RS (2009). Science. 324, 1312. Li, X, Zhu, Y, Cai, W, Borysiak, M, Han, B, Chen, D, Piner, RD, Colombo, L, and Ruoff, RS (2009). Nano Lett. 9, 4359. Sutter, P, Sadowski, JT, and Sutter, E (2009). Phys Rev B. 80, 4759. Ago, H, Ito, Y, Mizuta, N, Yoshida, K, Hu, B, Orofeo, CM, Tsuji, M, Ikeda, K, and Mizuno, S (2010). ACS Nano. 4, 7407. Coraux, J, N’Diaye, AT, Engler, M, Busse, C, Wall, D, Buckanie, N, Heringdorf, F-JM, Gastel, RV, Poelsema, B, and Michely, T (2009). New J Phys. 11, 023006. Sutter, PW, Flege, J-I, and Sutter, EA (2008). Nat Mater. 7, 406. Oznuluer, T, Pince, E, Polat, EO, Balci, O, Salihoglu, O, and Kocabas, C (2011). Appl Phys Lett. 98, 183101. Liu, X, Fu, L, Liu, N, Gao, T, Zhang, Y, Liao, L, and Liu, Z (2011). J Phys Chem C. 115, 11976. Dai, B, Fu, L, Zou, Z, Wang, M, Xu, H, Wang, S, and Liu, Z (2011). Nat Commun. 2, 522. Yu, Q, Lian, J, Siriponglert, S, Chen, YP, and Pei, SS (2008). Appl Phys Lett. 93, 113103. Li, X, Cai, W, Colombo, L, and Ruoff, RS (2009). Nano Lett. 9, 4268. Vitchev, R, Malesevic, A, Petrov, RH, Kemps, R, Mertens, M, Vanhulsel, A, and Haesendonck, CV (2010). Nanotechnology. 21, 095602. Kim, Y, Song, W, Lee, SY, Jeon, C, Jung, W, Kim, M, and Park, C-Y (2011). Appl Phys Lett. 98, 263106. Lee, J-K, Chung, H-J, Heo, J, Seo, S, Cho, IH, Kwon, H-I, and Lee, J-H (2011). Appl Phys Lett. 98, 193504. Kim, J, Ishiharta, M, Koga, Y, Tsugawa, K, Hasegawa, M, and Iijima, S (2011). Appl Phys Lett. 98, 091502. Bae, S, Kim, H, Lee, Y, Xu, X, Park, J-S, Zheng, Y, Balakrishnan, J, Lei, T, Kim, HR, Song, YI, Kim, Y-J, Kim, KS, Ozyilmaz, B, Ahn, J-H, Hong, BH, and Iijima, S (2010). Nat Nanotech. 5, 574. Hesjedal, T (2011). Appl Phys Lett. 98, 133106. Polsen, ES, Mcnerny, DQ, Viswanath, B, Pattinson, SW, and Hart, AJ (2015). Sci Rep. 5, 10257. Kobayashi, T, Bando, M, Kimura, N, Shimizu, K, Kadono, K, Umezu, N, Miyahara, K, Haytazaki, S, Nagai, S, Mizuguchi, Y, Murakami, Y, and Hobara, D (2013). Appl Phys Lett. 102, 023112. Yamada, T, Ishihara, M, Kim, J, Hasegawa, M, and Iijima, S (2012). Carbon. 50, 2615. Zhong, G, Wu, X, D’Arsie, L, Teo, KBK, Rupesinghe, LN, Jouvray, A, and Robertson, J (2016). Appl Phys Lett. 109, 193103. Ryu, J, Kim, Y, Won, D, Kim, N, Park, JS, Lee, E-K, Cho, D, Cho, S-P, Kim, SJ, Ryu, GH, Shin, H-AS, Lee, Z, Hong, BH, and Cho, S (2014). ACS Nano. 8, 950. Kang, S, Lim, K, Park, H, Park, JB, Park, SC, Cho, S-P, Kang, K, and Hong, BH (2018). ACS Appl Mater Interfaces. 10, 1033. Ci, L, Song, L, Jin, C, Jariwala, D, Wu, D, Li, Y, Srivastava, A, Wang, ZF, Storr, K, Balicas, L, Liu, F, and Ajayan, PM (2010). Nat Mater. 9, 430. Zhou, G, Pan, G, Wei, L, Li, T, and Zhang, F (2016). RSC Adv. 6, 93855. Kasry, A, Kuroda, MA, Martyna, GJ, Tulevski, GS, and Bol, AA (2010). ACS Nano. 4, 3839. Kwon, S-J, Han, T-H, Ko, TY, Li, N, Kim, Y, Kim, DJ, Bae, S-H, Yang, Y, Hong, BH, Kim, KS, Ryu, S, and Lee, T-W (2018). Sci Rep. 9, 2037. Bae, S-H, Kahya, O, Sharma, BK, Kwon, J, Cho, HJ, Ozyilmaz, B, and Ahn, J-H (2013). ACS Nano. 7, 3130. Bokdam, M, Khomyakov, PA, Brocks, G, Zhong, Z, and Kelly, PJ (2011). Nano Lett. 11, 4631.